The year is 1983, and as Marillion seek to recreate the sound of Genesis past, the band themselves continue to develop a new musical identity in their 12th studio outing, the either untitled or eponymous collection of nine songs, all credited to the trio of Banks, Collins & Rutherford. 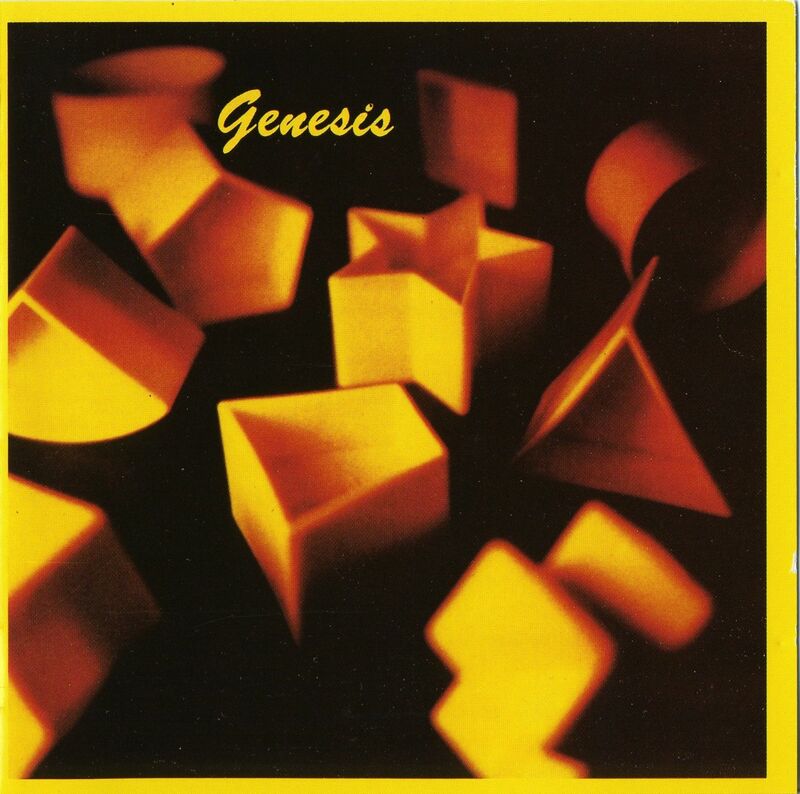 This album continues the development of the Genesis sound of the 1980s begun on 'Abacab', though it would be fair to say that that development is patchy at best. The sleeve design is another piece of work by Bill Smith, who had designed the 'Abacab' cover, and features a dark and slightly blurry collection of geometric shapes from a child's shape-sorter, with nothing else other than the band's name (or the album's title). The album opens with 'Mama', an atmospheric song which begins with a pattern on the drum machine which loops throughout the first part of the song. The song builds with the introduction of keyboards and then vocals. By verse 2 guitars are introduced to give a little more shape. There is a little menace in Collins voice, which grows as the song proceeds, and the middle section builds to a peak as the gated drums come in and dominate from then on. Collins' voice becomes more strident and passionate as the song builds to its crescendo and this rocking tune slowly fades. 'That's All', by contrast, is quite a light, jaunty number. It starts with a simple 2-beat kick drum/ hi-hat rhythm and electric piano leading into the vocals, with guitars coming in at verse two. Structurally simple, it comprises verse 1, chorus, verse 2, chorus, bridge, instrumental verse, chorus, bridge, verse 1, instrumental finish, with a lyrical simplicity to match. Pure pop. Side one finishes with an extended two-part song, 'Home By The Sea' and 'Second Home By The Sea', which may be some kind of ghost story, or may simply be about losing ones identity as life ebbs away in a nursing home. Either way, this is perhaps the most 'prog' song on the album. There is good interplay between the guitars and drums, some eerie, ethereal keyboards at times, and a sense of passion and power in the vocals - the band at their best here, I would say: certainly at their most inventive for a while. 'Second Home...' is mainly an instrumental where the whole band gets to make their mark, with thudding drums throughout, soaring keyboards and choppy guitars. From the (almost) sublime to the (almost) ridiculous, as Side two opens with 'Illegal Alien'. Quite why Phil has to sing this song in the style of Speedy Gonzales is beyond me, other than he was clearly in acting mode here. A mixture of Latin and reggae rhythms does slightly confuse the song, and some might think the lyrics and delivery a little un-PC these days. 'Taking it All Too Hard', although credited to the whole band, has a strong Banks feel to it in places, but not so much in the chorus: perhaps that's where the collaboration happened? It's harmless enough, but there's just not that much to it as a song, to be honest, though it does give scope for Phil's more soulful voice at times. If the last song was Banks' work, then 'Just a Job To Do' sounds very Rutherford in its make-up. Staccato guitar dominates the early part, and it's quite a guitar-heavy tune throughout. Interestingly there are a couple of occasions where we get a short EWF-style horn 'stab', but playing on the keys this time. All in all not a bad song, with a good driving beat throughout: not great, but not bad. 'Silver Rainbow', however... what can I say? It appears to be a song about being in love, but for me it's just 4½ minutes of my life I won't get back. Lyrically banal and musically tedious. Not a big fan, in case you couldn't tell. We close with 'It's Gonna Get Better' (perhaps apt after the last song). It begins quite moodily with reverse keyboards, then drums - emphasis on the third beat, which seems to happen quite a bit on this collection - and a quite lyrical bass line. There seems to be some level of social commentary here: this was the era of Thatcher and record unemployment: no longer are Genesis singing about nymphs and hogweed, but about real issues in today's world - as they will on later albums. So, an album of two halves, really, with side one definitely the stronger of the two. As I pointed out above, this was Thatcher's Britain, where commercial and financial success seemed to be all that mattered, and maybe that was being reflected in the kind of music that Genesis were producing (or were being encouraged to produce). Sadly so much of what the band have shown themselves capable of producing seems to be missing from it.